and ASHI in NIE and NIOI. KINSUJI. NAGAYUKI TEN-WA (t: KAWACHI-no-KAMI YASUNAGA: OSAKA ISHIDO. standing MIDARE-UTSURI. MASAME in the SHINOGI-JI. OBUSA CHOJI-MIDARE in tight NIOI-GUCHI is expected. MIDARE BOSHI has TOGARI turn. CHOJI with TATARA will differentiate. Rated Saijo Wazamono Supreme Sharpness. 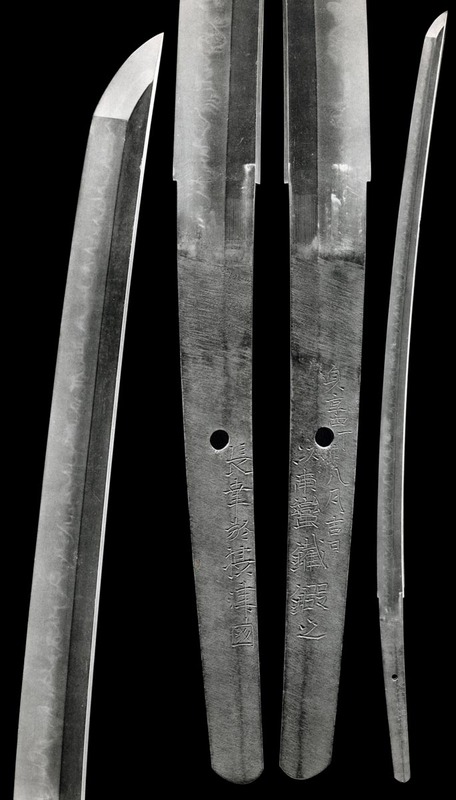 Shinogi-Tsukuri, Ihori-Mune, deeply curved to elongated Chu-Kissaki. Itame Hada that runs. 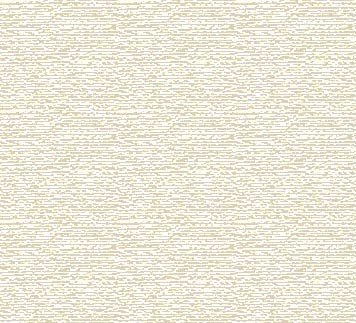 masame in te Shinogi-Ji and Mokume in the Koshi-Moto. Mounding Hiraki Gunome-Midare Ba fills the Ji and sends Tobi-yaki across the Shinogi in this largely Nioi-Deki Hamon. Omote Boshi is Midare-komi to Yakizume while Midare-Komi Ura is Maru Kaeri. High-rising Daibo and Juka Choji-Midare reach for the Shinogi. There are Ashi and Yo and some Ko-Nie. Strong Kinsuji snake through the lower. Boshi is Hiro width Gunome with Ashi that turns on a point. 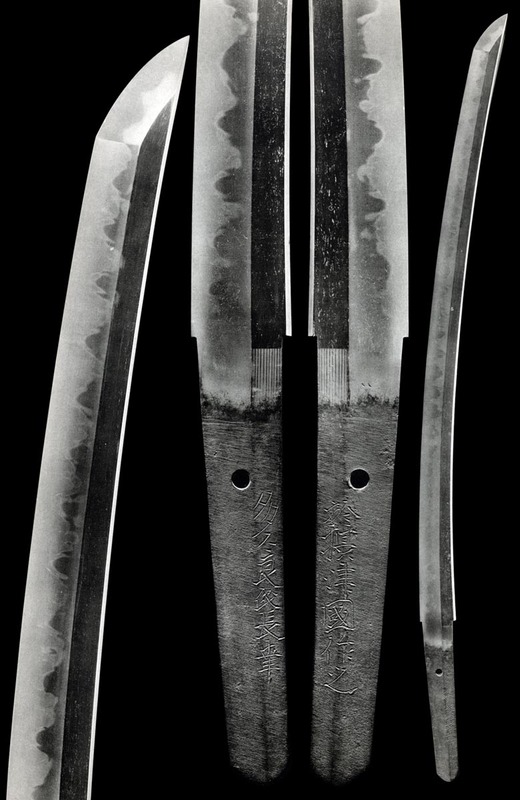 Shinogi-Tsukuri, Ihori-Mune, somewhat deep Sori to Ko-Kissaki. Ko-Itame Hada runs while Masame is seen in the Shinogi-Ji. Nioi-Deki Choji Ko-Choji-Midare mix with Ashi and Yo and some Ko-Nie. Notare-Komi Boshi is Hiro width with Ko-Maru. Shinogi-Tsukuei, Ihori-Mune, wide, strong, braod Chu_Kissaki. Ko-Itame Hada with Ji-Nie. Jigane stronger at the Habaki-Moto. Ichimonji style Gunome Choji-Midare Ba with much Ashi and Yo. Nioi is defined. Midare-Komi Boshi has Togari turn and medium fall. Itame Hada with Masame in the Shinogi-Ji. Ji-Nie. Hiro-width Notare has Ko-Gunome Midare in Nioi and Nie with Sunagashi sweeping through figures. Ubu, Kengyo Jiri with one Mekugi-ana. Shinogi-Tsukuri, Ihori-Mune, deep Sori to Chu-Kissaki. Sugu Ko-Midare of Ko-Gunome with Ashi in Nioi and Ko-Nie. Chu-Sugu Boshi with Kinsuji to Ko-Maru and long Kaeri.